The experts at AHEAD have identified the top five hottest trends in headwear for 2014. 1. Colors that pop – Take a good look at players on any of golf’s professional tours, or go no further than the local club, and it’s clear that players today are seeking bolder, brighter colors. AHEAD has responded by introducing for 2014: sunkist, comet orange, marigold, Georgia green, lagoon blue, cornsilk yellow, boysenberry, azalea, periwinkle, and both hot and power pink. 2. Fit as a Fiddle – Avid hat wearers can relate to those “one-size-almost-fits” caps that have a great look but regrettably a dreadful fit. AHEAD continues its quest to satisfy the growing “proper fit” appetite by taking a tailored approach to providing options. For the first time in a few years, AHEAD has introduced a new size – the “mid fit.” It is designed to represent that perfect fit between the existing extreme cut (a more shallow cap) and classic cut (for the average to deep head shape). AHEAD introduces the mid cut with the debut of the Newport Washed Cap collection, a washed-twill line with 13 color choices. 3. ‘Hi’ tech – Apparel has been trending “technical” for years and now hats are following suit – but without a negative impact to their look or feel. The designers at AHEAD have responded with three smart tech caps for 2014 that more than fit the bill: Tech Mesh Fitted Cap, Smooth Lightweight Tech Cap and Textured Tech with Lip Cap. 4. Total washout – Anything more hip than a cap that has a “washed out” look but that brand-new feel? The “washed out” cap is all the rage for 2014, say the experts at AHEAD, who are introducing the new (yet nostalgic) Newport Washed Twill Cap and Sandblasted Canvas Cap collections. 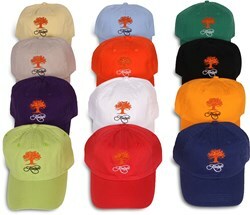 Moreover, AHEAD is bringing back no fewer than seven of its “Pigment Dyed” style caps: Solid, Sandwich, Two-Tone, Long Bill, Mesh and Dyed Contrast. 5. Ornamentation Techniques – AHEAD’s new alternative graphics for Performance headwear focus on a combination of direct and raised embroidery, and printed labels using modern fonts in combination with golf club logos. Verbiage is the focal point for a neater, cleaner look. The printed Coolmax labels allow for lots of detail at small sizes so the front ornamentation does not overpower the technical appeal of the cap. More casual caps like the “washed twill” and “sandblasted canvas” caps, both with a nostalgic appearance, require complementary graphics. The lettering styles keep with the traditional feel of the caps – advertising and packaging lettering from the 1930s and ’40s, athletic scripts from the ’50s and ’60s, timeless collegiate fonts, and distressed “vintage” canvas labels that appear to be as washed and worn as the caps on which they are embroidered. For additional information about AHEAD, visit http://www.aheadweb.com. Founded in 1995, AHEAD is a multi-dimensional brand with a proven track record of success distributing headwear, apparel, and accessories to the green grass, resort and corporate markets. Its single focus of providing quality products, with innovative, high-quality design, and merchandising concepts has led to 18 years of continued growth and expansion. AHEAD is a leading supplier of headwear to the USGA, PGA of America, Ryder Cup and numerous PGA Tour events in addition to more than 5,000 green grass and resort shops throughout the world. Among active professional golfers who wear AHEAD gear on the course are Jim Furyk, Sean O’Hair and Brittany Lincicome. Golf legends Arnold Palmer, Jack Nicklaus, and Annika Sorenstam wear AHEAD exclusively.